The Vision Mega Bra is suitable for all of us who appreciate volume, beauty and functionality. A cross-breed between a fly fishing vest, a chest pack and a small day pack. Mega Bra has six zipper pockets in front, two inside and one in the back. Additionally, it has five mesh pockets and one large expandable rear pocket roomy enough for example for your shell jacket and lunch. 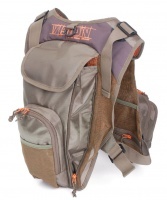 Mega Bra has two integrated zingers and five D-rings (one for attaching your landing net). 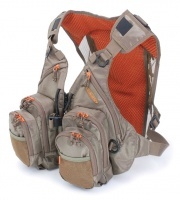 It is easily adjustable for every size and a short front YKK zipper and a buckle secure it when needed. The inside material of the vest is a strong mesh enabling proper ventilation. This multi-purpose combo is easy to put on and extra padding in the back makes it comfortable to wear during long fishing days. Olive Green and Military Green.